​Start the celebrations the moment we pick you up. Whether you are a large group celebrating graduation, or a select few off to a party or dance, we have a fleet of top of the line limousines and party buses to meet any requirements. You can leave the driving to us while you all party together on the way to the venue and on your return. No need to worry about directions, parking, drinking and driving or using multiple cars. Please note however that drinking is not permitted for high school graduation events. Everyone must be of age. 1. Professional chauffeurs. All of our drivers are dressed professionally and have been trained to provide a high class service. They will ensure that they are punctual and get you to your destination in comfort and style while you relax and enjoy a memorable event. 2. Our limos and party buses are lavish. Our fleet of vehicles is second to none. Each is equipped with sound system, CD/DVD player, flat screen television, bar area, and finished off with luxury leather seating. 3. Our aim is to please. Whatever your program, we will make sure that all schedules are met. We can cater for multiple pick-ups and drop-offs, and will deliver you to the door of the event. No need for you to worry about parking, or spoiling your shoes and clothes by having to walk from a parking area to the event. 4. Graduate with ease. Driving and parking in and around the Bethesda and Rockville area can be hellish. By opting to use one of our stylish limousines, your chauffeur takes away your need to stress and worry about traffic and parking, making it easy for you to relax and enjoy the night. Party the whole night! You can start the party the moment your chauffeur collects you. Instead of all driving separately and arranging to meet up at a designated place, you can travel together. While your driver gets you to where you want to be, you can commence the party on the way. 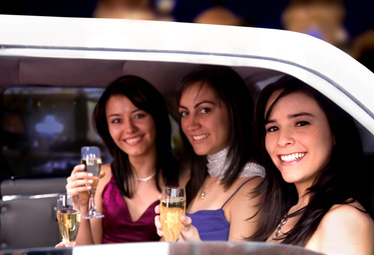 Take two minutes to complete the online form above for graduation limousine to obtain your “FREE Quote.” Alternatively contact us on 301-825-8833.